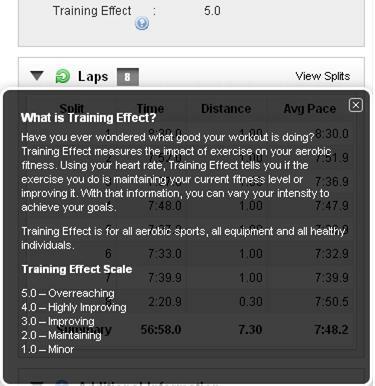 Since I got my Garmin 610, I’ve become interested in the Garmin Training Effect. And I get a lot of people coming to my blog after searching on it. You can read more about what it is here. 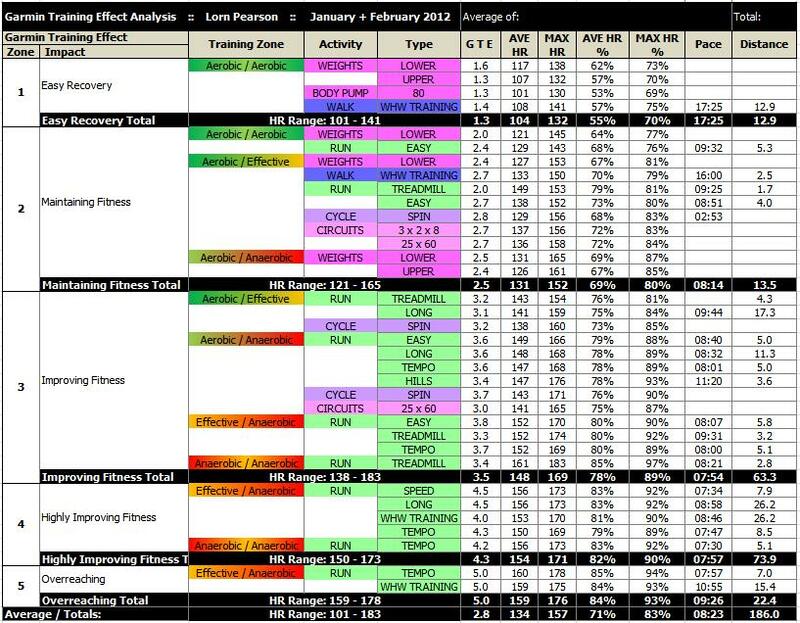 I wanted to do a bit of analysis on my Garmin Training Effect, so at the start of the year, I started collating my workouts in a spreadsheet. The spreadsheet works for monthly and yearly totals, but also gives me a really good bit of analysis on how the types of activities I do, and my heart rate affect my Garmin Training Effect. It shows me that based on the Garmin Training Effect, my runs seem to help Improve my fitness (3.0 – 5.0). Speed Tempo and Long get a good 4.0, whilst I got just two 5.0’s with last nights Tempo run and a rather challenging long run on the West Highland Way at the end of January. Based on my Heart Rate Training principles, my runs are Aerobic, Effective and Anaerobic. Walks, Bodypump and Weights tend to come in at 1.0, Aerobic / Easy Recovery. And Weights, Walks on the WHW, Circuits and Spin come out at 2.0, Maintaining Fitness. This entry was posted in Analysis, Gadgets, Heart Rate and tagged 1.0, 2.0, 3.0, 4.0, 5.0, 610, activities, analysis, effect, garmin, heart, heart rate, rate, training. Bookmark the permalink. Interestingly, the Training Effect that is calculated is relative to the individuals current fitness level. So, if two people of different levels of fitness were to undertake identical exercise sessions of equal intensity and duration then they would be expected to produce different Training Effect values; with the “less fit” person scoring a higher Training Effect value than the “fitter” person. That is to say that the level of intensity and duration of that single exercise session has had a greater effect in improving the cardiorespiratory condition of the “less fit” person than the identical exercise session had on the “more fit” person. This stands to reason I suppose, given that the more we improve our fitness there is a “law of diminishing returns” which comes into effect as more effort is required to produce relative gains in fitness. To determine the persons’ current level of activity the user is initially required to enter an assessment of how regularly they exercise during one week and this value is entered either into the heart rate monitor itself or the computer programme to which the monitor will interface. Thereafter, HRMs such as the Garmin 610 and Suunto Quest (using Firstbeat Technology) will update the activity class based upon the personal historic data of the users’ actual exercise sessions as recorded on their heart rate monitor. It’s also true to say that the SAME exercise can have different TE values based on fatigue. The watches use HR variability to ascertain the stress the exercise places on the body. Hi Liz. I did find that when I got my new Garmin the calorie burn seemed to drop. I’m not sure there’s anything we can do about it, or which device is correct. Sorry!